Burma, left, and Ivan. Photo courtesy of Tacoma Public Library. Baby Ivan showed up from the Congo cute as a button, though a big button. He is seen here with another baby, Burma, in August 1964 shortly after arriving in Tacoma. 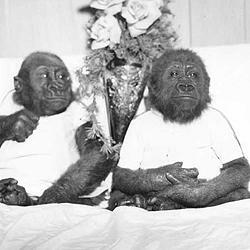 The gorillas were purchased by E. L. Irwin, the owner of the B&I Circus Store at 8012 South Tacoma Way. Burma died soon after arrival. Ivan lived at the Irwin home, doing such eye-catching things as joining the family for visits to the dentist. Soon, his growing size and energy meant he had to move into a gorilla house at B&I, where he stayed nearly 30 years even while other tourist attractions died off and he became the lone animal there. The authors remember visiting the shopping center and talking to people about Ivan, only to jump when the gorilla would leap from one end of the complex to the other, apparently enjoying startling people. He would also watch a black-and-white television. A 1991 documentary alerted the nation to his situation, and people around the world protested that this was not a natural situation for a gorilla. In 1994, Irwin's family let him go to the zoo in Atlanta, GA. In an event at B&I, people signed cards for Ivan and shared memories of an innocent childhood in a different world. Ivan lived the rest of his life in the company of other gorillas. He died at age 50 in 2012.